Compact upper frames of minimum-swing machines like Hitachi's Zaxis 225USLC allow them to work close to obstacles. Hitachi says the 225USLC is 7 percent more stabile than its 200LC, probably due to a special counterweight and an additional 8,000 pounds. The minimum-swing's working envelope is squeezed by allowing the boom to be pulled back further to reduce the front swing radius. Construction Equipment's 2003 Universe Study indicates that only skid-steer loaders, backhoe-loaders, and wheel loaders are more populous than crawler excavators in the United States. And only the articulated-truck population is growing faster. The 40,000- to 60,000-pound size range is the largest segment of the hydraulic-excavator universe, and equipment marketers eager to cut themselves a piece of this pie have brought some of the industry's most refined technologies to its machines. The computerizing of engine and hydraulic-system control is nearly complete in the 40,000- to 60,000-pound range. Virtually all diesel engines needed computer-controlled fuel injection to meet the EPA's exhaust-emissions limits. Manufacturers tied the engine controller to sensors on hydraulic systems and are now able to match torque curves to various hydraulic flow and pressure priorities to achieve maximum performance and efficiency in a variety of excavator tasks. One group of manufacturers—Case and Link-Belt, Caterpillar, Deere and Hitachi, JCB, Kobelco and New Holland—sells machines that can automatically select a work mode. Modes combine hydraulic flow priority to boom, stick and swing functions with engine performance for peak efficiency in various kinds of work such as hard digging, fine grading, lifting, and working with attachments. Another group of manufacturers—Komatsu, Volvo, Liebherr, Hyundai, Terex and Daewoo—leaves mode selection in the operator's hands. "When you have an electronically controlled engine and hydraulics, there are a lot of automatic features you can add to a machine," says Dave Wolf, excavator marketing manager at Case. "The engine can derate itself to protect the machine if you start to lose oil pressure, for example. Or you can get auto power boost where, depending on conditions, the computer can increase power temporarily by about 10 percent." Power boost requires judicious use. Most machines in the 40,000- to 60,000-pound range have the feature. Some are automatic, plus the operator can engage power boost by pushing a button. It's useful to keep the bucket moving through a tough spot, but employing it usually slows front-end functions. The extra power is wasted if there is no extraordinary load to overcome and reduced speed actually diminishes productivity. On-board computers have also improved and extended the diagnostic ability of the monitor panel in the operator's cab. Most systems record fault codes so that technicians can download a record of troubles machines have experienced. Many systems log performance parameters so managers can download records of how much time a machine has worked in various modes. The fact that most brands have adapted some version of these technologies is a testament to the intensity of competition for excavator sales. A marketing agreement that supplied Terex with Daewoo excavators to sell illustrates both the allure that this product category wields on equipment marketers, and the barriers to engineering and manufacturing the machines. Several companies have formed alliances to defray the cost of putting their brand on excavators. There are 14 brands but only 10 manufacturers—41 models but only 31 distinct machines in the 40,000- to 60,000-pound excavator class. 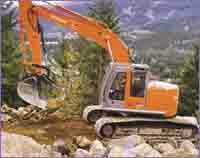 The distinction between Hitachi and John Deere excavators or Case and Link-Belt is often more significant than the differences between Ford and Mercury or Chevy and GMC. Deere uses its engines in the same base excavators that Hitachi powers with Isuzu or Mitsubishi. Case uses its own diesels in the matching Isuzu- and Mitsubishi-powered models from Link-Belt. Engine differentiation is faltering, though. Case introduced the minimum-swing-radius CX225 with the same Isuzu engine as its Link-Belt counterpart, the 225 MSR Spin Ace. Similarly, Deere has begun branding minimum-swing-radius machines with the same Isuzu as Hitachi's. There are no power-train differences between Kobelco's SK210 and New Holland's EH215, or between Terex and Daewoo excavators in this size range. Where components are the same, their dealer networks and the arrangement of standard and optional features differentiate the brands. "We spec a lot of things that are optional on the Daewoos—long carriages, bigger alternators, turbo precleaners," says Ed Samera, service manager for heavy construction equipment at Terex. "It's kind of like the difference between Mercury Sable and Ford Taurus." Case New Holland—the conglomerate that markets as Case, New Holland, and Kobelco—and its joint-venture partner, Link-Belt, have paired up in two two-brand teams to market eight distinct excavators in the 40,000- to 60,000-pound range. Case and Link-Belt both market three machines designed and built in the Sumitomo joint-venture plant in Chiba, Japan. Kobelco is marketing the other five CNH machines, which are designed and built in the Kobelco plant in Calhoun, Ga. New Holland's EH215 is a rebranded Kobelco SK210. Case and Deere's additions of minimum-swing-radius machines to this size class, and Cat's increase of horsepower in its 321C, hint at the growing importance of minimum swing radius. 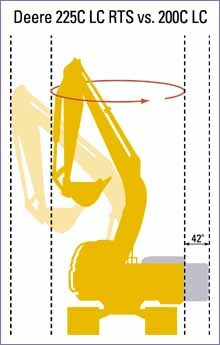 Minimum-swing-radius excavators have a shorter upper frame. The counterweight does not extend as far beyond the machine's track width, so they can work in confined areas. The house on Komatsu's PC228USLC, for example, can spin within a width of just over 13 feet, allowing it to work in one traffic lane. Other variations on the conventional excavator theme include narrow versions by Case, Caterpillar, Hyundai, JCB and Volvo. They squeeze a bigger machine's digging power into an 8- or 9-foot transport width. Several manufacturers will add simple blades to their excavator carbodies, but only Kobelco's ED190 Blade Runner carries a power-angle-tilt blade. The 11-foot-wide blade and heavy-duty undercarriage take what is normally a 36,800-pound SK160 up to nearly 44,000 pounds. The dozer folds to reduce transport width to 8½ feet. But the ED190 only packs 112 horsepower, and its 10,880-pound lift capacity is the smallest among crawler excavators in the 40,000- to 60,000-pound range. If you're shopping for a conventional excavator in this busy size class, the greatest differences between brands is probably not found in the list of features. It may well be in the software that commands the electronic controls, and sometimes the important distinctions can only be felt through the joysticks. About 40 base models compete in the 40,000- to 60,000-pound size range in North America. Volvo and JCB rate their lifting capacities without a bucket, while other manufacturers measure lift capacity with a bucket attached. These specifications are based on information provided by manufacturers and are for comparison purposes only.